Using Stockrank Movers as an Upgrade Signal. James Fisher - A Case in Point? Every morning I take a 10 minute tour of the Stockrank Movers to see if any of companies in my universe have been upgraded by >10 units. 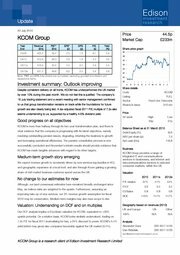 Since their results 2 days ago the newly computed James Fisher and Sons (LON:FSJ) numbers have gained +30 to 91 for Stockrank score and the Quality score has jumped +35 to 89. James Fisher was already showing excellent Momentum (Score 99), so the Stockrank improvement is largely a Quality score “Upgrade”. James Fisher and Sons (LON:FSJ) passes 22 of 25 on my Mark Minervini screen and the fails are very slight. I will look in more detail in the morning. Another nice James Fisher and Sons (LON:FSJ) price lift this afternoon. Hopefully more to come? Yes I bought after seeing your post and added to this morning. Can you beat the market with blended Value Ratios ?